This trip offers the perfect combination of adventure and relaxation. Choose between a canoe, solo, or tandem kayak to explore this beautiful section of the Niobrara River. This trip will offer a stop at Smith Falls waterfall, the tallest in Nebraska! This is a great half day float if you only have a limited time in our area. Opportunity to Visit Smith Falls waterfall, the tallest in Nebraska! Expect a peaceful paddle through one of Nebraska’s most beautiful spots. On this trip you’ll have the chance to see the impressive Smith Falls waterfall, Nebraska’s highest waterfall. 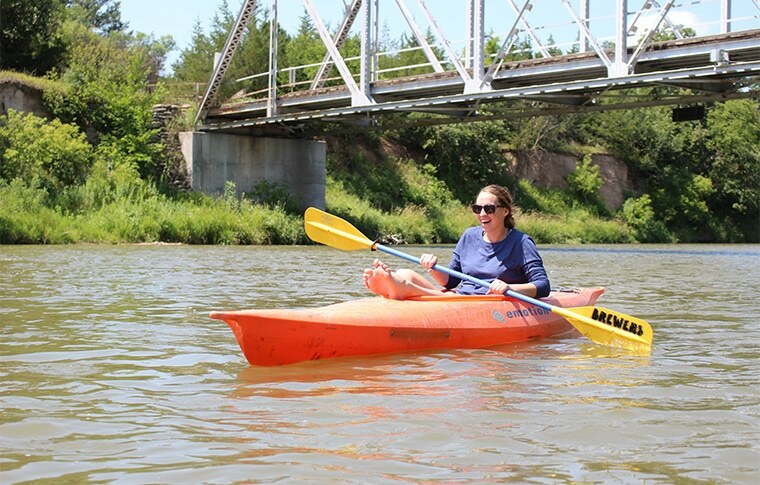 You can choose between a tandem kayak/canoe or a solo kayak to take in the beauty of the Niobrara River, a Top 10 Canoeing River in the United States. We provide life vests for all kayak/canoe trips which must be worn at all times by those under 12.